(NationalSecurity.news) Just how far ahead of other countries is the United States when it comes to weapons development? When you have the ability to destroy technology that your country began using first, that’s pretty advanced. Consider the rising use of drones. The United States has deployed drones in battle for more than a decade and now, finally, many other nations are beginning to develop and deploy their own drone forces. 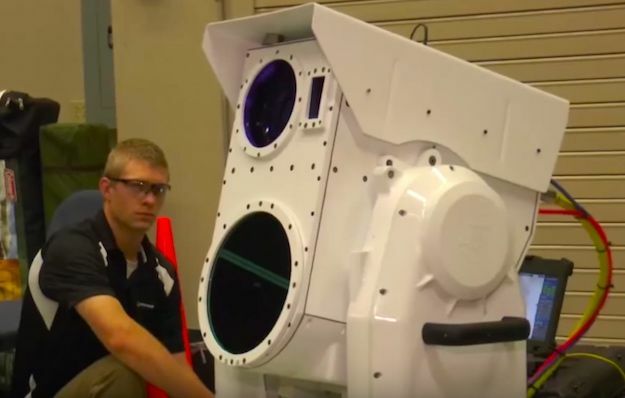 But the Boeing Corp. has developed a new laser cannon that can take down enemy drones in seconds – or blind their sensors so they cannot operate effectively. Called the Compact Laser Weapons System (CLWS), it can track down an unmanned aerial vehicle (UAV) and eliminate a threat in real time, Fox News reported. In August, the laser took part in “Exercise Black Dart,” which focuses on cutting-edge technology to tackle hostile drones – weapon-carrying vehicles that can fly great distances and strike without even a moment’s notice. The CLWS focused on the tail section of one drone and, within 10-15 seconds disabled it and knocked it from flight. Unlike in the movies, where laser weapons fire split-second beams of light you can see, the CLWS fires an invisible beam its designers say makes it difficult for an enemy to target. The system is capable of identifying and tracking both air and ground targets as they are moving by employing a mid-wave infrared sensor. The weapon has a range of about 40 kilometers, or about 25 miles. Laser weapons provide another two key advantages – they have unlimited magazines provided there is power, and the cost for each shot tends to be a lot lower, Fox News reported. Boeing is currently working on a number of laser systems similar to the CLWS that target drones, fast attack boats (like those used in the Persian Gulf), rockets and mortars. In addition, the U.S. Navy has deployed a ship-mounted laser system that should be capable (in clear weather) of defeating small ships and aircraft.